I found some hidden features of the WatchESPN app on Apple TV that make it the best overall tool for U.S. cable and satellite TV subscribers who want to absorb as much of the sites and sounds of World Cup without actually being there. Most of the features highlighted in this article are also available to users of WatchESPN on iOS, but they are in a different place in the app. See the related article WatchESPN on iOS Puts "Replay" Tab in a Different Place Than on Apple TV for details. Not sure about the exact location of these features on other platforms because we don't have them at this time. There is a dedicated section of the app for the World Cup, which currently appears in the "Featured" section of the app. This might be the best way to watch highlights of already played games that is available to U.S. sports fans. The World Cup 2014 section is also contains some features that are really buried deep in the menu system that some World Cup fans will want to see. I will try to watch ESPN over live television during the next few days to see if they mention any way of accessing these features. But, this article will illustrate the hidden features I've discovered so far, and how to access them. Most game highlights can be found under the "Related Video" tab. The highlights of previously contested games, daily recaps, and other broadcast features are typically found in the "Related Video" tab of the "2014 FIFA World Cup" content area. Note that they the producers tell you the length of each video clip in this view. The time listed is in minutes and seconds. During the Opening Round of the 2014 World Cup, the highlights available included the Brazil - Mexico game, perhaps the most exciting 0-0 tie I've ever seen in any sport. I was able to go through this set of highlights and watch all of the important action including every single goal of the first five days of the World Cup in less than 30 minutes. Check out anything marked "Highlight Reel". This looks like B-Roll for each World Cup game. This could be really valuable for screengrabs if you are blogging the World Cup. I would credit ESPN if any screengrabs are used on a published website, such as we are doing here. The "Tactical Cam" is unedited overhead camera coverage of a game. Here is one overhead shot from the Brazil-Mexico game on June 17. Check out a vertigo-inducing shot of the spectator area behind one goal at the Brazil - Mexico game. In this overhead shot from early in the Brazil - Mexico game, you can see all 22 players, the referee, and one of the referee assistants. This is ideal footage for illustrating how plays develop in the event of a goal. That's why I call it the telestrator replay. 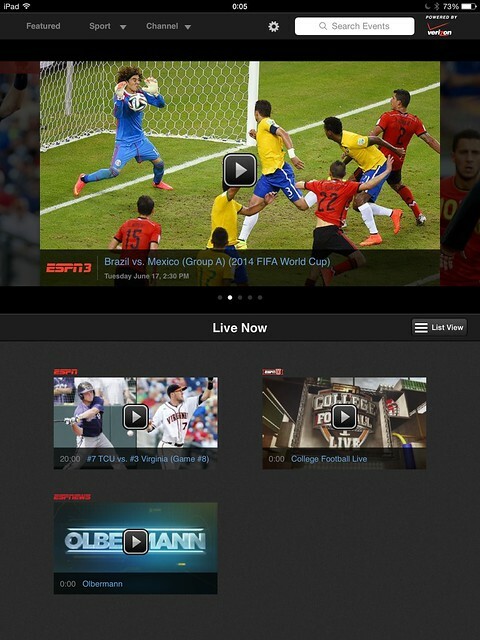 But, What About WatchESPN on the iPad? After finding all of this great stuff on WatchESPN on AppleTV, I thought, "This is great, I can't wait to watch this stuff on my iPad." Then I went and looked for it. The WatchESPN iPad app doesn't appear to have a dedicated World Cup section. I've looked at the app several times over the past two days and not found it. The "Featured" area is a carousel, like on Apple TV, but that carousel seems to focus on things that are live or coming up shortly. When it contains past events, they tend to be recorded versions of SportsCenter and single-event replays, like the Brazil - Mexico match from yesterday shown in the photo above. If you need to activate WatchESPN on your AppleTV, see Activating WatchESPN on Apple TV. Some friends and readers tell me that some Internet providers owned by cable companies automatically validate your eligibility to access WatchESPN. Readers and friends tell me that the Android version of WatchESPN has many of the same features I illustrated on Apple TV, and that the Android version runs on Google Chromecast . I will try to confirm. Others tell me that WatchESPN on Roku is more like Apple TV than iOS in terms of broadcast features. If you can help out with screengrabs of the WatchESPN user interface on Android, Google ChromeCast, or Roku, and want to contribute to our guides, send them to us via Twitter, @OperationGadget. We'll be happy to give you credit. This makes me wonder if the iOS app is less full featured than others, and if so why? I continued to research the iOS app and found that the same video features are available, they are just in a different place. Read the new article, WatchESPN on iOS Puts "Replay" Tab in a Different Place Than on Apple TV, if you want the details. Credit for all of the contents of the screenshots goes to ESPN. We are illustrating their WatchESPN app for our readers, who are follow televised sports and the technology used in all aspects of sports and sports journalism. I love seeing websites that understand the value of providing quality information. Thanks for sharing. game killer android This is a great post thanks for sharing this informative article.. I visit your blog regularly for some latest post. Windows 7 Key Windows 7 was planned from initiation to be a move up to the Windows line of working frameworks while in the meantime staying perfect with the equipment and applications Windows Vista was good with. Stick to the fantasy writing as selling snake oil isn't working out for you. Show the proof Michael that the data is good. Or stick to the snake oil game. Wonderful data. I believe of which regards while using important specifics besides knowledge you may have so shown on this page. Right now remember to click this usacheckcashingstore.com/oceanside Using cheers after for all those give good results. Continue to be the top. There are some intriguing due dates in this article yet I don't know whether I see every one of them focus to heart. There is some legitimacy, however, I will grab hold feeling till I investigate it further. Great Hostgator coupon code article , thanks and we might want more!